Making something new out of something old is always fascinating to me. I had the opportunity to meet Marelle, a local designer who takes things from the past and turns them into beautiful pieces of art and accessories. Here’s a closer look of the artist, her company and her beautiful vision. I started making the couture bags about seven years ago, and it just sort of took off. Some have been sold to women as far away as Spain, Brazil and Australia. Now they are my favorite item to design. It really wasn’t any one thing. I have been drawing and painting since I was a small child. I did my first portrait at the age of five. I have never wanted to do any other line of work. It feeds the soul, and that, to me, is better than any other job I can think of. A lot comes from women from the past. I just love vintage and Victorian items. I also look at what people are wearing, what is trendy. Sometimes I just start a piece and see where it goes. Most of my vintage jewelry came from a lovely little lady I met, I call her mamma. She and her husband had been collecting jewelry for over 60 years. He passed away, and I bought most of what she had. Everything else comes from estate sales, auctions and online vintage stores. At first, this was just an idea I had — to make a tactile touch exhibit for the blind. I sent out e-mails to blind councils to see if it was even possible, or wanted. I was invited to bring my art to the PBA convention in Harrisburg. The exhibit was very well received. When the president of the PBA touched a three dimensional portrait I did, he said, “I have not had sight since I was five, but, when I touch this painting, I get an image in my mind.” That said it all! I felt like I had accomplished the impossible. I put an image into the mind of a man who could not see. The blind understand faces, and I am told that is why my exhibit works. My exhibit has visited several blind conventions and centers. I have been asked to do other celebrities, such as, Dorothy from “The Wizard of Oz,” Paul McCartney and Lucille Ball. This exhibit gives me great joy and satisfaction. I have also learned that the blind do appreciate art, if given the chance to view it, in their way. I think I am all over the map on that one. Besides purses, I design jewelry, hair pieces, hats and custom clothing. I paint murals, modern art, furniture and portraits. I have even done the program covers for the Pocono Raceway and logos for businesses. My most accomplished medium, however, is pastel portraits. A painting called “Sara’s dress.” It is a mixed-media piece of a little girl’s pink dress. It is just so delicate and touching. I just love the subtle pink and beige colors. When it comes to my jewelry and purses, I keep the pieces I like. Sometimes it is hard to part with something as personal as your art. You leave a piece of yourself in everything you create. I sent some of my work to the Lambert Castle in New Jersey, that was alongside many other artists. Besides that, at the Bergen Performing Arts Center in New Jersey, my exhibit was shown alongside of The Blind Boys of Alabama — they are Grammy Award-winning gospel singers. I also had a show at the Kirby Center alongside the Trans Siberian Orchestra Revival. 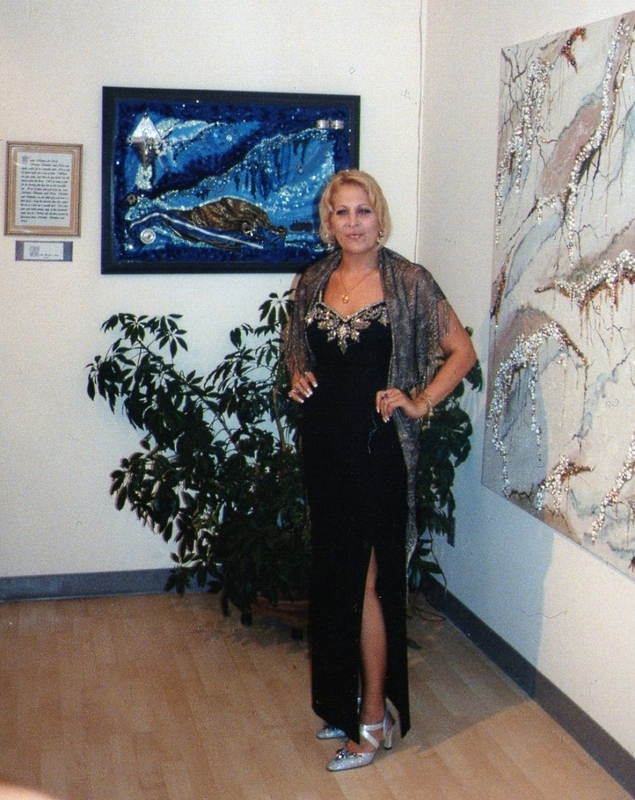 For quite some time I have been doing solo shows, the first one at Allure Salon and Gallery. If I could find other artists willing to participate, I would love to include them in this exhibit. As strange as it sounds, it is modern/vintage and sometimes borders on avant-garde. I do have a saying for my accessories, “Only One for the One and Only You,” so I try to create a variety of different pieces, for a variety of different women. Absolutely, I have done many consigned pieces. If you can imagine it, I will find a way to design it.